IBPS Recruitment 2017 for 7875 Nos. Clerical cadre in Nationalized Banks: Last Date 03-10-2017. - Jobs4NE : Jobs in Assam and North East India. IBPS Recruitment 2017 for 7875 Nos. Clerical cadre in Nationalized Banks: Last Date 03-10-2017. 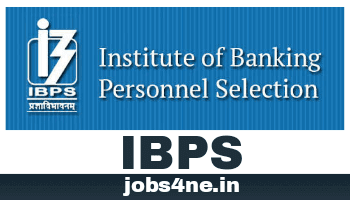 Institute of Banking Personnel Selection (IBPS) invites online applications from eligible candidates for CWE Clerks -VII for the post of 7875 Clerical cadre in Nationalized Banks. Activity Tentative Dates On-line registration including Edit/ Modification of Application by candidates: 12-09-2017 to 03-10-2017. Payment of Application Fees/ Intimation Charges (Online): 12-09-2017 to 03-10-2017. Online Examination (Preliminary): 02-12-2017, 03-12-2017, 09-12-2017 & 10-12-2017. Name of the post: Clerical cadre (CWE Clerks -VII). Total no of posts: 7875 Nos. Arunachal Pradesh : 08 Nos. Dadra & Nagar haveli : 07 Nos. Daman & Diu : 08 Nos. Himachal Pradesh : 73 Nos. Jammu & kashmir : 34 Nos. Madhya pradesh : 290 Nos. New Delhi : 272 Nos. Tamil Nadu : 1277 Nos. Uttar Pradesh : 665 Nos. West Bengal : 417 Nos. Age Limit: Minimum 20 years & Maximum 28 years of age as on 01-09-2017. Upper age relaxation for SC/ ST Candidates is 5 years, for OBC Candidates is 3 years and for PWD Candidates is 10 years. Participating Banks: Allahabad Bank, Canara Bank, Indian Overseas Bank, UCO Bank, Andhra Bank, Central Bank of India, Oriental Bank of Commerce, Union Bank of India, Bank of Baroda, Corporation Bank, Punjab National Bank, United Bank of India, Bank of India, Dena Bank, Punjab & Sind Bank, Vijaya Bank, Bank of Maharashtra, Indian Bank and Syndicate Bank. For SC/ ST/ PWD/ EXSM Candidates: Rs. 100/-. For All Others Candidates: Rs. 600/-. How to Apply: Candidates can apply online through IBPS website: http://www.ibps.in/ on or before last date.